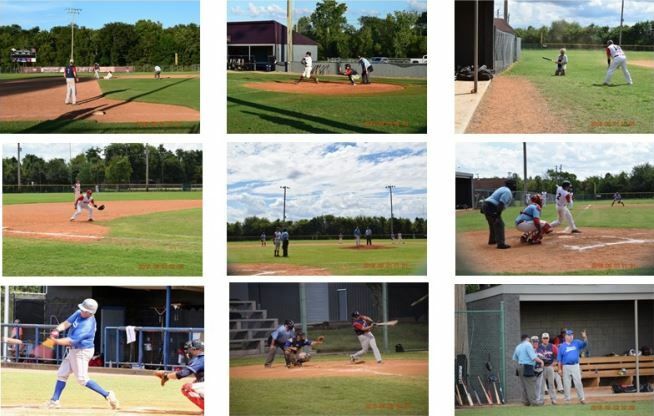 The 27th Rocket City Classic MSBL Regional Tournament was played over Labor Day weekend in Huntsville, Alabama. This year the tourney featured 18 teams over the 40+ and 55+ divisions. Games were played across nine separate High School and College fields in the cities of Huntsville, Madison, and Decatur. The tournament featured local talent and teams as far away as San Antonio, St Louis, Memphis and Atlanta. After seeing rain showers off and on in the area for the previous three weeks, the teams were blessed with beautiful, rain-free weather that allowed all games to be played on time. Officiating featured High School and College-level umpires with 3-man crews officiating the Championship games. The 40+ stories are shown below. HERE is a link to the 55+ Lonestars story published previously. 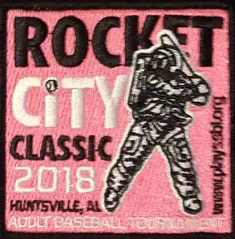 The Tennessee Dirtbags finished at 5-0 to become the 40+ division champions of the 2018 Rocket City Classic. The Dirtbags faced a tough Chattanooga Cookouts team during pool play and again for an 11-inning Semi-Final victory. Excellent pitching performances came from Gabe Orendorff, Rick Miller, Gary Dover and Scott Williams. The Dirtbags were also boosted by top hitting performances from Gabe Orendorff, Dave Hacker, Rick Miller and Ed Tignor with batting averages of .600, .474, .429 and .409 respectively. Hitting for the cycle and paving the way to a Dirtbag MVP acknowledgement was Gabe Orendorff. Gabe hit for the cycle in the first game of the weekend against the Memphis White Sox with a double in the first, a home run in the second, a single in the fifth, another double in the sixth and a triple in the eighth to complete the cycle. Gabe finished the tournament with four triples over the weekend resulting in a BA of .600, SLG of 1.300 and an OPS of 1.952, along with pitching a total of 12 innings, nine of which came in a 7-0 shutout against the Cookouts. The Mid-South Legends set out to repeat their quest for another championship over Labor Day Weekend in 2018. The Legends first squared off against the Louisville Hammerheads on Saturday morning and things did not start well as the Hammerheads managed to plate four runs in the top of the first inning. But the Legends MVP center fielder led off the bottom of the first inning with a double. Later that inning Lowell Mooneyham was able to close most of the four-run gap by connecting on a three-run homer. Legends pitcher Rick Rossi settled down in the second inning and would not surrender any more runs through the eighth inning. Mooneyham relieved Rossi during the ninth inning to earn the save in what turned out to be an 8–6 final score. The Legends took on the Birmingham Cardinals in the second game on Saturday as Mooneyham took the mound again since he was already warm. He pitched a strong nine innings as the Legends went on to win by a score of 7 – 1. The Legends faced another formidable challenge when going against the Decatur Braves on Sunday morning. The Braves had scored 38 runs in their two opening games, but Legend starter Jack Denton was up to the task as he went the distance and gave up only four runs. Kirk Caraway hit a clutch two-out double to knock in two runs in the bottom of the fifth inning to give the Legends their first lead of the game. The Legends added some insurance runs in the ninth and went on to win by a final score of 8–3. Team Captain Jodie Wolfe took the mound for the Legends in their Semi-Final game against the Rocket City Reds and also went the distance. The Legends took advantage of a couple of fielding miscues scoring six runs in the sixth inning, resulting in a final score of 9–4. Unfortunately for the Legends their magical run came to an end in the Championship game against the Tennessee Dirtbags. The ‘Bags put up two runs in the first inning, three more in the fourth, and never looked back. The Legends couldn’t come up with a timely hit and lost by a final score of 7–4. 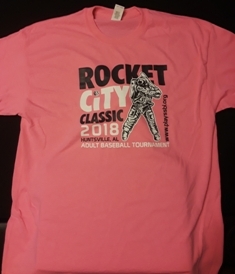 After winning the 55+ championship the previous two years at the Rocket City Classic Labor Day Tournament, the Tuscaloosa Tornadoes rolled into Huntsville looking for a 3-peat in 2018. Tuscaloosa went 2-1 in pool play to earn a spot in the Playoffs. Winning 10-7 over a tough Huntsville Stars team, they advanced to the Championship for the third straight year. But the Tornadoes were shutdown by a very good San Antonio Lonestars team and the quest was over. Philip Ellis and his staff ran a first class tournament and the Tuscaloosa Tornadoes look forward to returning next year.